Submitted 2 months 1 week ago by Sarah Nuttall. Richard Rottenburg joins WiSER as Distinguished Professor of Science and Technology Studies. He is known internationally for his contribution in shaping the global interdisciplinary field of science and technology studies which has emerged at the intersection of sociology, philosophy, history, anthropology, feminist theory, and other disciplines. Richard has been an important voice in the revitalization of debates between anthropology and philosophy around issues of post-foundationalism and translation; and the rapidly developing social study of quantification and mathematical and computational knowledge systems, including machine learning and artificial intelligence – and their application to multiple questions of governmentality and knowledge production on the African continent. Amongst many other books, he is the author of Far Fetched Facts (MIT Press, 2009) and editor of The World of Indicators (Cambridge, 2015). His formidable contributions emerge from his deep investment in philosophical debates and at the same time his close and engaged working relationships with people and research sites across the African continent. Mpho Matsipa joins WiSER as a Researcher from April of this year. Mpho will divide her time between the Wits School of Architecture and Planning, where she holds a position as lecturer in design and urban research, and WiSER. She completed her PhD in Environmental Design in Developing Countries at the University of California, Berkeley, on the topic of ‘The Order of Appearances – Urban Renewal in Johannesburg’. Since 2016 she has been a researcher in design and urbanism at the Wits City Institute. Mpho is currently the curator of the African Mobilities Project. The project aims to rethink the geography of African migrations and the challenges and opportunities they pose for doing architecture and urbanism differently, at the intersection of migration, displacement and digital technology. African Mobilities is conceptualized as a space, a conference, a digital publication and a mobile pedagogical platform that connects fourteen diverse locations through workshops and masterclasses; Johannesburg, Harare, Kampala, Addis Ababa, Munich, Luanda, Abijan, Lagos, New York, Dakar, Nairobi, London, Lubumbashi and Praia. 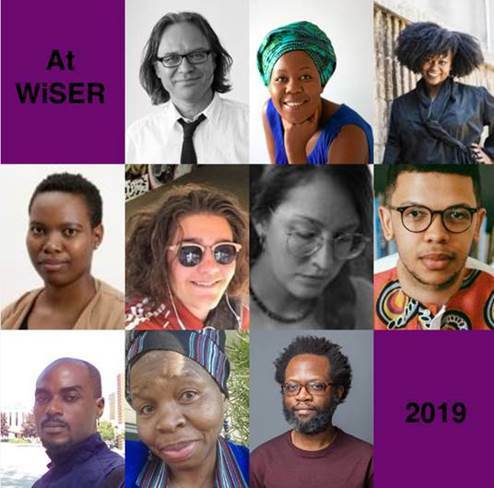 Sisonke Msimang, fast becoming one of South Africa’s most talented writers, will join WISER as a Writing Fellow in 2019. She is the author of the stellar memoir, Always Another Country, shortlisted for the Sunday Times Barry Ronge Fiction Prize. Her biography The Resurrection of Winne Mandela has just appeared. In addition to these books, Sisonke is a regular contributor to the New York Times, the Washington Post, the Guardian and to the websites Africa Is a Country and the Daily Maverick. She is also a frequent guest on the BBC and Al Jazeera. Before turning to writing full time, she was director of the Open Society Initiative for Southern Africa (OSISA), and a consultant on issues of gender and social justice. Sisonke holds an undergraduate degree from the prestigious liberal arts college Macalester College, Minnesota and an MA in Political Science from UCT. She was a Yale World Fellow and a World Economic Forum Young Global Leader in 2012. In 2015, she was a Ruth First Fellow at Wits University. Sizwe Mpofu-Walsh joins WiSER as a Writer in Residence in 2019. His first book, Democracy and Delusion: 10 Myths in South African Politics (2017) won the City Press-Tafelberg Nonfiction Award. The book was accompanied by a rap album of the same name. In 2015, he was awarded an MPhil with distinction in International Relations at Oxford where he is currently completing a DPhil on the politics of nuclear-weapon-free-zones. His new book project, set for publication in 2020, explores the thesis, “apartheid didn’t die; it was privatised”. Tinashe Mushakavanhu holds a PhD from the University of Kent, on the topic of anarchism in the work of Percy Bysse Shelley and Dambudzo Marechera. He is also the co-creator and lead researcher on a project called Reading Zimbabwe. This is a digital archiving of Zimbabwe’s published history over the last 60 years. The project is collecting, cataloguing, digitizing and making available as many Zimbabwean publications from the 1950s to the present as it is possible to identify and locate. Many of the key books of Zimbabwe’s literary canon, for example, are out of print. In addition to books, this archive will eventually include published serials, documents, pamphlets, manuals, audio and video. Tinashe joins WISER as a Post-doctoral Fellow. Part of his research work will focus on interpreting the data the archive has so far accrued, writing about the patterns emerging from this very major digitising project. Tinashe will also be working towards the publication of a book called Dambudzo Marechera: Anarchic Poetics, while at WiSER. Teresa Colliva, who is spending six months at WiSER this year, is currently enrolled in the second year of the PhD program in Global Histories, Cultures and Politics at the University of Bologna (Italy). Her current research focuses on contemporary Italian culture, in particular in how Africa was represented and narrated during the 1960s and 1970s. Her background is in literature, history, and music and she constantly tries to deal with her topic and interests gleaning from different fields of analysis: cultural studies, media and film studies, visual studies, sociology, semiotic, anthropology, critical theory. Her MA dissertation was on the representation of Africa in Italian mass culture during the 1950s and the 1960s. From this study she has developed the idea for the doctoral project. Souad Zeineddine is a Marie Skłodowska-Curie Fellow at the a.r.t.e.s. Graduate School for the Humanities Cologne and is based on site as a Visiting Researcher at WISER. As part of the a.r.t.e.s. EUmanities global programme, Souad Zeineddine is pursuing her doctorate within the project “Envisioning-Scaling-Infrastructruing: The port of Durban and its city” (Working title). Her academic interests lie in ethnographic theory, postcolonial theory, new materialism, queer and feminist Theory, STS Anthropology and (postcolonial and feminist) STS. From a (postcolonial and feminist) STS perspective, Souad’s project seeks to bring the Anthropology of Infrastructure into dialogue with the Anthropology of (modern) time. Within her theoretical framework envisioning-scaling-infrastructuring are constitutive for the coming into being of conflictual and contradictory temporalities. Okechukwu Charles Nwafor just concluded a six months Postdoctoral fellowship at the African Studies Centre (ASC) of the University of Michigan where he was a University of Michigan African Presidential Scholar (UMAPS). He is here at WiSER to complete the next six months as a Mellon Postdoctoral Fellow on Photography and Visual Culture (a collaboration between WiSER and ASC of the University of Michigan). He has completed a book manuscript currently with the University of Michigan Press on his book titled Asọ ebì: Clothing, Visual and Popular Culture in West Africa. At WiSER he will be working on another book manuscript titled Obituary Photographs and the struggle for high visibility in Eastern Nigeria. His articles have appeared in many journals including Postcolonial Studies, African Studies, Nka, Journal of Contemporary African Arts,Critical Intervention, Cultural Critique, African Arts, among others. He is also an associate professor at the Nnamdi Azikiwe University, Awka, Nigeria. Mbali Khoza is an artist and Art History and Visual Arts Lecturer at Rhodes University whose research interrogates authorial identity in artistic practice, by posing the question 'what difference does it make whose is speaking?’. Through a critical analysis of post-colonial artist practice, she investigates the ways in which artists use visual language to not only speak but rethink ways of speaking. Khoza has participated in a number of exhibitions, such as the Gwanza Photography at the National Gallery of Zimbabwe (2011), Rechewed at the Centre of Historical Reenactments (CHR), (2011), Out of Thin Air at the Michael Stevenson Gallery, Cape Town (2012), After After Tears, with CHR at The New Museum, Museum as Hub,New York (2013), Regions A-G, Johannesburg Library (2013), BLINDSPOT at the National Arts Festival, Grahamstown (2014), next thing you know, Blank Gallery, Cape Town (2014), Poetics of Relation, LiveInYourHead, Geneva (2015). She is currently enrolled at WiSER as a History of Art PhD student. Her PhD research examines the historicity of blackness, black existence and black expressive culture.